Cyprus itself has been classified as a destination country for victims of trafficking, mainly for sexual and labour exploitation, even though other forms of trafficking, such as for the purposes of begging, more commonly in children of Roma origin, street prostitution, removal of organs and marriages of convenience, also take place (KISA & Turkish-Cypriot Human Rights Foundation, 2014). Despite the fact that people in their own country may find themselves in exploitative situations (internal trafficking), in the case of Cyprus, as indeed in other European Union member states, migrants constitute the major target group for traffickers and therefore represent a population particularly vulnerable to labour exploitation and trafficking. The 18th October is the yearly EU Anti-Trafficking Day, a day that enables policymakers and the general public to reflect on the response to trafficking in human beings in Europe. Cyprus itself has been classified as a destination country for victims of trafficking, mainly for sexual and labour exploitation, even though other forms of trafficking, such as for the purposes of begging, street prostitution, removal of organs and marriages of convenience, also take place. 1) A social media campaign. 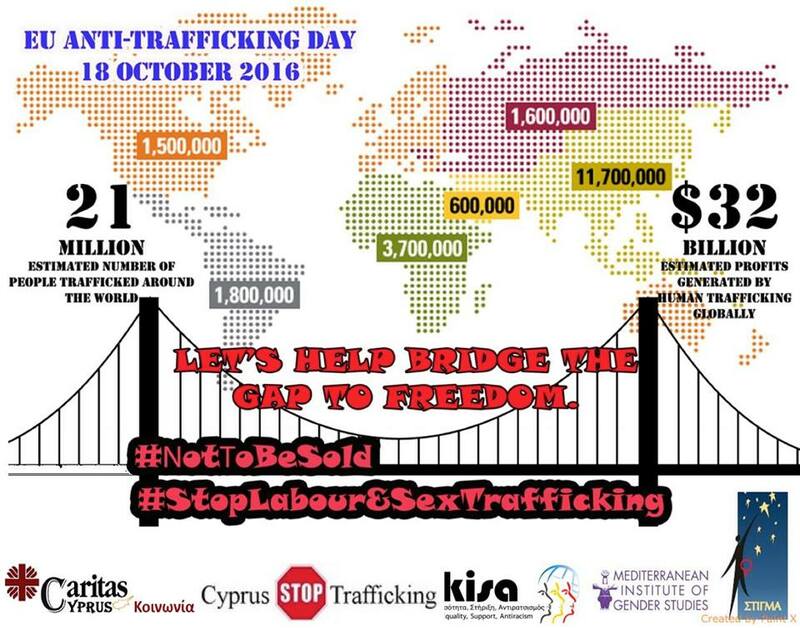 We would like to start a chain of self-awareness regarding the EU Anti-Trafficking Day in an effort to “help bridge the gap to freedom”. To participate in this chain, please share the ‘Bridge the Gap’ image along with the following message: ‘’I support EU Anti- Trafficking Day by vouching to raise awareness on the reality of human trafficking in my local context. #ΝotΤoBeSold #StopLabourAndSexTrafficking#THB. You can follow this media movement on Facebook (KISA , Mediterranean Institute of Gender Studies (MIGS), Cyprus STOP Trafficking,Stigma Organisation, Caritas Cyprus-Κοινωνία), Instagram (@kisa_cyprus) and Twitter (@MIgsCy). 2) A gathering of solidarity in support of anti-trafficking entitled ‘Together against Trafficking in Human Beings’. This gathering will take place on Ledra Street (by McDonald’s) on the 18th of October from 14:00 – 17:00. In this event, the co-organisers of the gathering will hold information stands aimed at informing on the present reality of trafficking and the differing manners in which one can support the fight against trafficking. Similarly, the individuals that are present will be filmed on-site to compile a video of support which will then be uploaded onto Youtube, Facebook, Instagram and Linkedin. We would really appreciate to have your online and physical presence for the fight against anti-trafficking on this important day. LET’S HELP BRIDGE THE GAP TO FREEDOM! The campaign also aims to raise awareness on trafficked asylum seekers and is implemented in the framework of the TRACKS project.